A good thing to remember when going over these documents is that everything you read is merely an Allegation. Even the Affidavits, which amount to sworn testimony, are to be considered “truths” as to the person swearing to them. I know the situation isn’t really all that fun but it is nice to be able to keep up with it. Kickstarter is always a risk, as is any investment into an unfinished good or service concept. That’s all part of the deal when you back the various projects offered on the site. You might not get your stuff. Currently I’m very interested in the situation surrounding one of the projects I personally backed, and gave a ton of lip service to back in the fall of 2012. 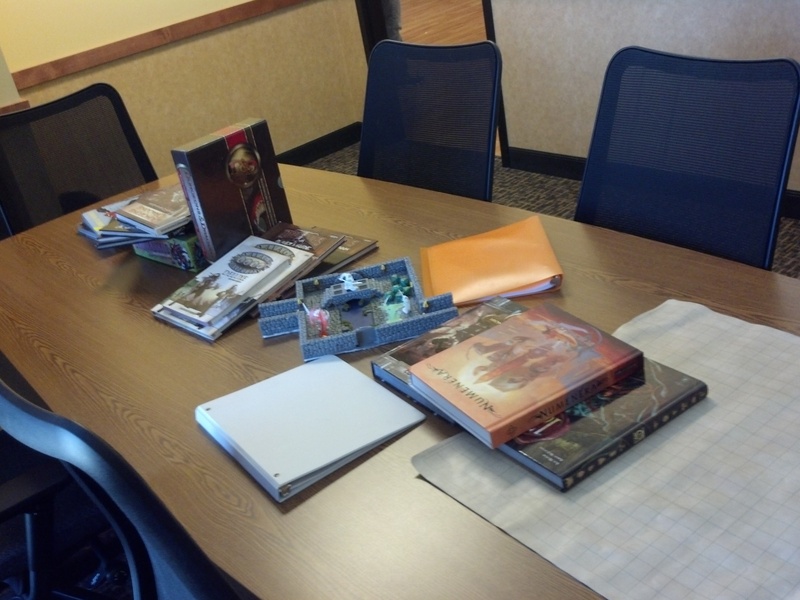 The Kickstarter project I’m referencing is a documentary titled “Dungeons and Dragons: A Documentary”. If you wish to read my original piece on it you can do so here. I was into the project right from the get-go. I believe I was even the third person to back it. I put in at the $75.00 level, not a tiny sum for me at the time, at this level I was aiming to get a 2-disc Blu-Ray with some cool supplemental footage. A bit pricy for a Blu-Ray but I love docs and I love D&D, I wanted to see the film succeed. Now, nearly two years past the funding, that might be a bit in jeopardy. Not long ago I stumbled across some rumoring online of another Dungeons and Dragons themed documentary headed for Kickstarter so I decided to check it out. I was very surprised to see some familiar names involved, namely James Sprattley & Andrew Pascal. You see, these two were originally part of “D&D: A Doc”. Discovering that they were not only no longer involved in the project I backed but instead now creating a competing project that was also asking for money made me groan audibly. Such a thing did not bode well for film I have been anxiously awaiting for a few years now. I did some digging and discovered that not only is there some competing interests going on, but this has now elevated to a litigated situation. I attach below the Summons & Complaint out of New York. A short version of the history laid out Plaintiff in this Summons & Complaint tells the tale of a falling out between the three individuals via a split of Anthony Savini, of Westpaw Films, INC. (Westpaw) from James Sprattley, and Andrew Pascal, of Iconoscope Films LLC (Iconoscope). Keep in mind this Factual History comes solely from the Plaintiff, Westpaw. The Complaint alleges that during and shortly after the successful funding of the project Iconoscope began to make financial and creative decisions that sought to omit Westpaw from much of the development. 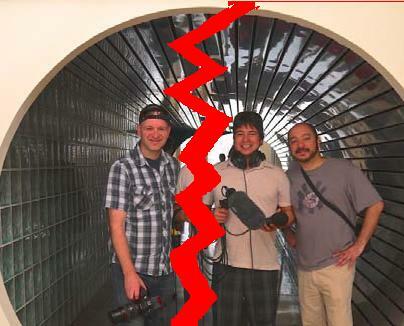 Due to this the relationship between them became strained, mediation was attempted and it failed though attorneys got involved and a Settlement Agreement was reached that was meant to resolve the disputes and move completion of the project forward. Iconoscope would quitclaim its interests in the video and audio footage to Westpaw. Westpaw would complete the film in good faith. The two companies would each own 50% of the equity. Westpaw would attempt to maximize revenues. Pascal and Sprattley would maintain a shared Executive Producer credit. Furthering the Plaintiff’s side of the story from the Complaint we are told that Sprattley and Pacal had formed a “secretive” partnership to produce the competing film “The Great Kingdom” under a new production company known as Fantasy Game Films LLC (FGF). After this reveal there is mostly the claim that FGF had been using the work on D&D: A Doc for quite some time to foster contacts for their own competing film for quite some time. We are also told of various situations where it is alleged that work done for the FGF film with various contacts was completed under the assumption that they were helping the D&D: A Doc film. All in all, it is quite the mess. So namely what we have here is this. We have a falling out of these filmmakers and the question of just what duty Pascal and Sprattley owe to the D&D: A Doc film, their partnership with Savini, and even what they may owe the backers for the Kickstarter for D&D: A Doc. I’m very unhappy to see all of this was going on behind the scenes, and I certainly hope I still get to see the film I paid money to see made. As I mentioned above though, backing anything is a risk and anyone going into a Kickstarter project feeling that once the money has been paid they are guaranteed a finished product is being a bit unrealistic. It can happen, the things you put money toward could fall apart easily. That doesn’t mean I’m excited, but my $75.00 is a sunk cost at this point, I’m not getting it back. The best I can hope for is a finished product someday. It may be a while though, Lawsuits take a long time. Personally, I’m not backing “The Great Kingdom”. I’ve been burned already by some of the individuals handling it. The actual preview looks really polished, and if it’s ever made I’ll try and catch it but at this point I’m just not confident enough the litigation won’t squash things. Even if it doesn’t, litigation can take a very long time. In a perfect world, both these docs could be made and I’d end up with two great films to see. I just don’t know what is going to happen here sadly. Although, anyone who knows a bit about the tormented history of ownership D&D itself has gone through probably sees the same sort of irony I see here. In the end I’m in the “D&D: A Doc” crowd out of necessity mostly, my money is already there. I’m very interested to see where this goes. I would hate for nothing to come from all this and we end up having no documentary on this subject because of differences of creative take on the subject. Naturally, there is only so much the people involved in this can tell us, you don’t really want to slip up and breach some sort of confidential material, but we can pay attention to the pleadings which are publically available so I’m keeping my feelers out to see if I can catch perhaps an Answer to the Complaint to get another side of this. I tried to be as Unbiased as possible here. I truly harbor no ill will to any of the players involved, I simply don’t know enough of the behind the scenes stuff yet and I’ll note again that the Factual History came solely from the Plaintiff’s Complaint. I’d love to hear what anyone else may have to say on this, so feel free to comment below. Also, if you feel I’ve misrepresented some information I’d love to handle any corrections. In late summer/early fall 2012 a Kickstarter for a Documentary regarding the history of D&D ran, the film is titled “Dungeons and Dragons: A Documentary”. It funded on September 17, 2012. I wrote a blog piece about it on September 3, 2012. A falling out occurred at some point during the making of the film and the primary groups formalized an agreement through the courts that dealt with remaining ownerships and duties to the film so that it could still be made to satisfy the investors (we Kickstarter Backers etc.). This Settlement Agreement was signed December 5, 2013. “The Great Kingdom” is helmed in part by individuals who were involved, and still are to an extent, with “Dungeons and Dragons: A Documentary” as Iconoscope Films. On or about June 20, 2014 Westpaw films filed a Complaint with the intent to keep “The Great Kingdom” from being made, rescind the original Settlement, and other forms of relief (some monetary) to be extracted from the defendants. I’m not going to pass judgment here, as I’ve stated before. I simply mean to pass along some details to those interested. Firstly, “The Great Kingdom” has funded so apparently the lawsuit did not detract people from contributing. This says to me that the lawsuit likely won’t go away as simply as it might have if the second film hadn’t funded. This is pure conjecture but I think settlement would have been far more possible if there was no Kickstarted second film. Now though, we certainly have two projects vying for existence here so it may mean that we might see a decision via Summary Judgment or even a full blown trial if there’s an issue of fact. Things may get really interesting. Honestly, I know too much about lawsuits to wish this situation on anyone. There’s going to be a lot of difficult times ahead for both parties and I can only hope they come to a peaceful resolution where no one really comes out a villain here, but that can be hard to achieve. Since July the court case has proceeded. Both sides presented their story before the court during the month of July. In Early August an injunction was Ordered against the Defendants (those behind The Great Kingdom) that essentially shut them down completely. They are restrained from “taking any action in futherance of the creration, production, manufacture, etc. for any documentary film about the fantasy role-playing game “Dungeons & Dragons”. The descision on the Motion to Dismiss has been adjourned to October 29, 2014 marking the date for the Plaintiff to respond to it for October 22, 2014. I’ve not commented on this matter in over half a year. As often becomes the case matters in litigation can become fairly sluggish near the endgame (if my assumption this will end in settlement holds true that is) and that appears to be the case here. Very little of substance has occured in months. Since October of last year there have been repeated requests by the Defendants to Extend the time required for them to Answer the Complaint filed by the Plaintiff and the Plaintiff has been stipulating to them. It appears that they are likely mired in Settlement negotiations at this time. Seems they’ve been at said settlement negotiations since October of 2014 actually. The last filing I see was yet another Stipulation to extend time filed on 03-02-2015. Both parties appear to be in agreement that more time is needed, my presumption still lies with settlement negotiations. Hopefully we will hear something soon! The latest development I’ve seen was an Order filed back in January calling for a Mediation to be held on 4-20-16. I don’t see anything in the court system showing that it didn’t go forward so presumably there were settlement discussions held. Hopefully we had a resolution favorable to the fans here. I can’t wait until this documentary stops being held hostage! So I survived my first time being involved with a con rather than just attending. I have to say the experience was incredible, and more than a little humbling. I remarked about this on Twitter but I’ll easily reiterate that any adults out there who feel they have a strong passion for their favorite hobby or fandom have forgotten the fervor teenagers can have for theirs. If nothing else, it was a shot of reality about how pervasive the enjoyment of geek culture has really soaked into our youth. It was incredibly fun seeing the kids immersing themselves into their favorite things and standing side by side with others and their fandoms to experience those as well. All of this fun was had with zero judgment. The first thing I noticed upon arriving for set up was that our venue was much larger than I expected. Honestly, my expectations for this entire thing were on the small side. I had never been to this particular library branch but the sister branch in my area, though not tiny, isn’t what I would call spacious for a con. Well, turns out that they have a large space at the Spencer Branch off of the actual library with large meeting facilities. So my fear of “where are we going to house the over 250 pre-registrants” was unwarranted. I was shown to my booth in the exhibit hall and was then shown my Panel Room. In hindsight, asking for a booth in the exhibit hall was something of a misstep on my part. I didn’t fully grasp what that hall would be, again an underestimate on my part…I had this issue a lot. It was a true blue Vendor Hall, and there wasn’t a shortage of Vendors either. I had nothing to sell and my intention was to just be available for anyone to continue conversation on a one on one basis after my Panel ended. This worked out great, mind you, but it also caused a little confusion for some as they assumed all my awesome RPG stuff was for sale and I had to keep clarifying that it wasn’t. I felt bad that I kept disappointing folks. My panel was pretty awesome. Unfortunately, it was housed in one of the smallest conference rooms but at first I didn’t consider this an issue because I had this nagging feeling that not a single kid would show. Because I felt like my panel would utterly fail, I was actually kind of happy to be hidden away in the smallest room. I was wrong (thankfully) I ended up not only having a full room, but they even had to bring in more seating! I think it was at this point I decided to stop inwardly second guessing myself and just go full fledged into enjoying whatever came my way here. The room, though small, ended up being pretty close to the perfect size. I started out just explaining what Tabletop RPGs are, using my typical comparison of a board game mixed with acting and cooperative storytelling. After that I realized pretty quick that everyone just wanted to sort of dive in so I let them all know they could page through the books at their leisure and I walked around answering questions about different systems and got a little more in depth about certain rules and even the different tools certain games utilize to work. They found it pretty cool that the game Dread, for instance, uses a Jenga tower rather than dice. The whole thing was far less formal than the larger panels I’ve attended at cons in the past but let’s be honest, these teens didn’t really want to just sit there and listen to me talk. They wanted to pal around with their buddies while checking out this “RPG stuff” to see if it was any fun. As the room was filling up! My panel was first thing in the morning so I then headed to my booth where I fielded more questions from some of the kids who followed me out there and even met with some kids who didn’t get the chance to make it to the panel but still wanted to chat with me. I had a lot of fun sitting there, and it gave me a good chance to look around at some of the other vendors & con guests as well. I can say with certainty that roughly 70% or more of the attendees were there for Anime. I’m an anime fan as well, I certainly enjoyed my fair share of it growing up and still do to an extent but I do not recall knowing a ton of other kids liking it all that much growing up. Another strong showing were the many Dr. Who fans. That show has a serious following among our youth. It’s actually kind of crazy how many Cosplay Doctors were there! Honestly, the many many cosplayers at this con were awesome. I ended up leaving around midafternoon as the kids interested in my shtick had waned away and, like I had mentioned, my booth was confusing to some since I had nothing to sell. Some of my more unique experiences include meeting one of the co-creators of Geekway to the West, who’s name I either failed to get or (to my shame) forgot, and meeting Mike Wilkerson of 2 Guys Talking, a local Podcasting network. There’s a lot of great Podcasts on his site, you should check them out. By far though the best thing about the con was interacting with some really great kids and hopefully introducing them to this hobby I enjoy so much. Allthough, I know at least one girl knew about D&D, she was excited to let me know that her grandfather loves the game ha ha! Who knows maybe they’ll give it a try some day. I already have some ideas for how I’ll handle next year, were I to be asked to return (here’s hoping)! Lastly before I leave this post to rest I have to thank the event’s coordinator and creator Maggie Melson. Thank you Maggie for giving me a chance to do something as unique as this, it was honestly a blast! If anyone wants to check out the Twitter feed from the con the hastage was #TeenFanCon. There are a bunch of cool pics people took there too! If anyone has any comments or suggestions for what I could bring to the table next year feel free to hit me up below! Look at that shadowy hand! Who could be behind that shadowy hand!? What could that shadowy hand mean for the future of D&D!!?? For those of us who keep tabs on this sort of thing we’ve known for quite some time that the launch of the newest edition of Dungeons and Dragons, the 5th edition of the game, will soon be upon us. It’s a thrilling time for us fans of the system, and while I’ve spent the last few years trying my hand at a myriad of other Tabletop RPG systems D&D was where I cut my teeth on Tabletop RPGs so it’s always been exciting for me to see a new iteration. 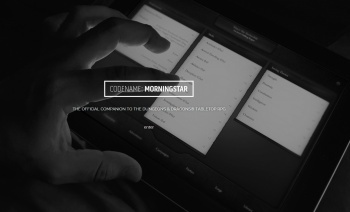 One of the hot topics surrounding the new release is a companion set of digital tools currently being developed by Trapdoor Technologies, under the title of Codename: Morningstar. If you visit the site dedicated to it we are given a one page rundown of some of the features these digital tools intend to cover. There are some expected items like bookmarking and a simple rules search function, or character creation tools. Some of the more interesting items noted are Adventure Management and Online\Offline play. This brings to mind an engine similar to Roll20 might be included in these tools. This would give players the ability to see some grid based combat on a tablet or other smart device. With the 4th edition of Dungeons and Dragons we there was the ability to, for a cost, access some useful tools online. The most useful of these tools being the encounter\monster building program and the Player Character generator. I found the character generator very useful for helping newer players create a character to play while allowing them to take a more active role in choosing aspects of their hero than simply handing them a pre-generated character sheet or spending hours explaining the character creation rules in the book. For seasoned players the character creator could be something of a crutch used to help remind them of all the possibilities spread far and wide amongst the many supplement books and Dragon Magazine options. The encounter\monster builder was just plain awesome. One of the benefits of 4th edition was an extreme focus on balance. This made crafting encounters a lot easier on paper, of course in game things could always go awry thanks to the randomness of dice rolls but that’s part of the fun. Monster abilities could be tacked onto customized monsters and easily adjusted to raise or lower difficulty. I honestly don’t have much ill to say about those tools. So thus I’m excited to see what this new set of tools can bring to the table, literally. The only concern I could have would be the price point. Even the simpler tools of 4th edition cost us some cash on a monthly basis, as those two builders were never offered up as single purchase (would have had my money immediately). I fully expect this to be a subscription situation with a monthly payment involved, much like the digital tools and access to Dragon Magazine was for 4th edition. Therein lies my expected issue with Codename: Morningstar, it’s almost assuredly going to be a subscription thing. I loved the tools from 4th edition. I just never needed them all that much, certainly not enough to keep up a monthly subscription. Basically whenever I needed the tools I paid the monthly subscription fee and used them for what I needed. Once done I would cancel my subscription and return perhaps a few months later when I needed it again. Granted they made some money off me but it was pretty annoying for me. I suppose I shouldn’t complain too much though, they offered the service and it was up to me whether I wanted to buy in. I just wish I could get my hands on a version of the Character Creator and Monster Builder for use right now, without a subscription. Hell, you still need to subscribe to this day in order to use those things and 4th is on its way out! Obviously we don’t have too much on how Codename: Morningstar (after typing this name a few times it sounds really annoying in my head, why couldn’t they just call it “Morningstar”?) will be handled but with a function like “all the latest D&D adventures and content will be available to download as they are released, simultaneously with the physical versions.” the subscription concept seems inevitable. There is the slight chance they mean “available for download, for its cost” I suppose, and Codename: Morningstar will just be a means to do so, but I somehow doubt it. I just need to see what kind of cost the subscription would be I suppose. It’s easy to see this blog post is just a bunch of analyzing a thing that doesn’t yet exist and therefore not much more than conjecture on my part, but at least I got the chance to talk about some of my likes\dislikes about how 4th handled its digital offering. So… there’s that I guess. I DO know that the folks over at Trapdoor Technologies has put out the request for folks to let them know what we think about the upcoming digital companion and even attempt to sign up for the Beta (I’ll have to see how I can get in on that). They even want our suggestions, ho boy, for what we’d like to see. I for one can’t wait to tell them all about my idea for an “Animal Part to Gold Coin” bartering system. I’m sure they’ll love it! What about you? Excited for Codename: Morningstar? Did you like\dislike the digital tools in 4th Edition? What would you like to see in a Digital Tools Companion (although don’t just tell me, tell the Trapdoor tech folks too)? Look at mah’ Wizard Face! If you’ll all glance upwards you’ll notice a bit of a change to the site. That’s right, I’m all professional and such, I’ve got me some original artwork for my banner! This awesome bit of cartooning is brought to you by none other than the NamelessPC himself, Wesley K. Hall. It looks great eh? Really captures my bearded glory. Wesley has a webcomic that updates every Tuesday & Thursday that focuses on what I would call “Awkward Funny”. Sometimes it’s gaming based, sometimes he touches on stuff from his day to day life, but it’s always a treat. So check it out! You can follow him on Twitter as @NamelessPC and he also has a Facebook Page. I’m getting excited, and admittedly a bit nervous, for this weekend! If you’ve read my post below you know all about where I’ll be this weekend. If you haven’t read it, give it a read over and feel free to give me advice if you feel so inclined. Good day and good gaming folks! I’ve remarked a bit on this upcoming convention on Twitter, but only in passing. So I’ve decided to give a more detailed update on this exciting opportunity that has come my way. Not to mention some of the things it has taught me about how great many of the business’ associated with Tabletop Roleplaying Games can be. 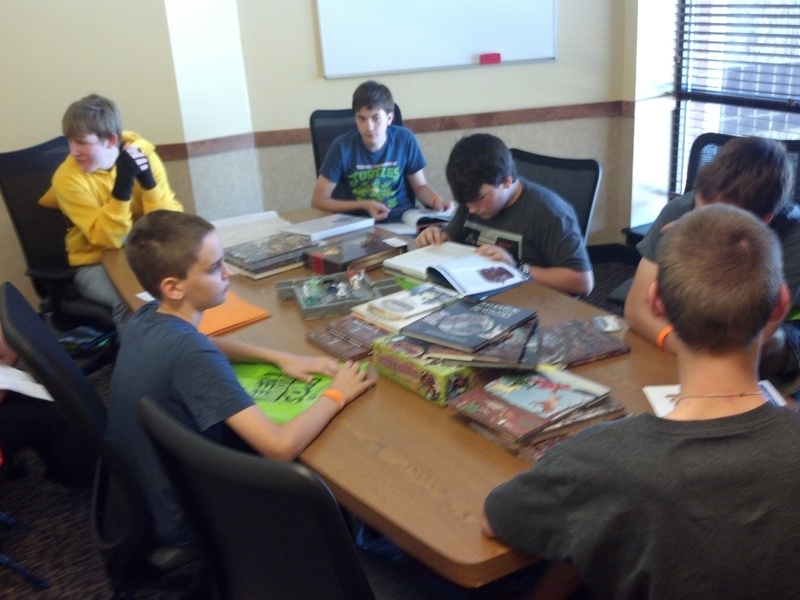 Not long ago I was contacted by the head of the Teen Outreach Committee for the St. Charles City/County Library District at the Spencer Road location regarding the County Library’s first ever Teen Fandom Convention. She wanted to know if I would be interested in manning a panel on Tabletop Roleplaying Games, and to a lesser extent boardgames. Of course I jumped at the chance and even offered to stick around for the entire day to run a booth of sorts where I will be on hand to answer any further questions anyone had. 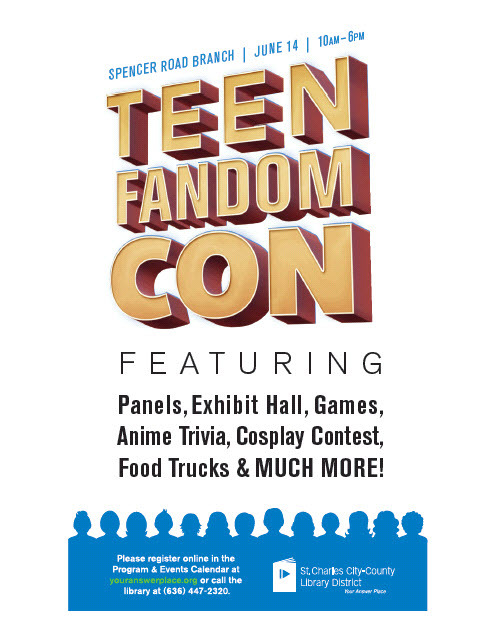 The Teen Fandom Con will focus on a myriad of hobbies and pop culture items that creates popular fandoms within our community, specifically geared toward the teen age-group. 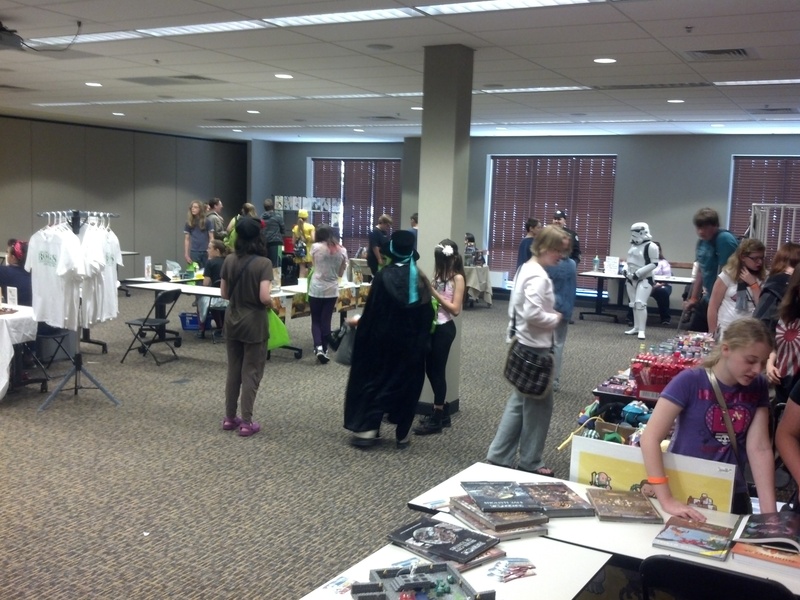 It started out just being an anime con, as that seems to be a strong interest in today’s youth. Heck, I was a fan myself growing up and still am to an extent. Never saw the popularity it seems to enjoy these days though, although we had to search a bit harder back in my day and…(right about now the rocking chair starts to creak so I’ll just move on). Now, along side my particular interests, the con will focus on things like Anime, Cosplay, Comics, Science Fiction, Fantasy, Dr. Who etc. Sounds like an neat little event, almost like a Comic-Con on a smaller scale. As a self proclaimed ambassador for Tabletop RPG’s (If anyone else wants to call me that, maybe I’ll put your quote on a business card or something :P) this is just the type of thing that excites me. Introducing new blood to our club of pen and paper gamers is something I’ve always enjoyed, and here is a chance to do it on a bit of a Macro scale. 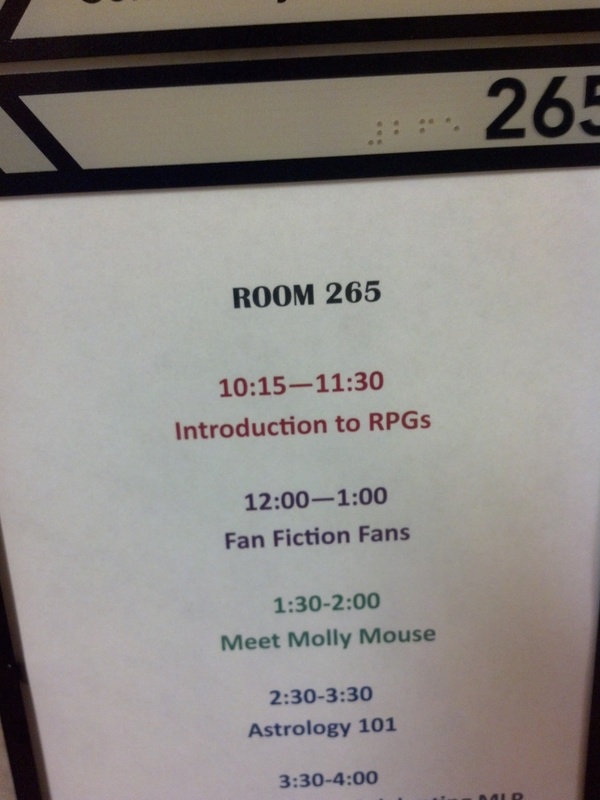 I’ll run my panel for an hour, answering questions people might have, and then I intend to camp out at my booth with most, if not all, of my library of RPG systems for people to peruse. I’ll also be on hand to answer more questions or even show people how to play the various systems if they have interest. At some point during my prep for this I decided to try my luck and reach out to some of the gaming companies for the various systems I owned and let them know what I was doing. I wanted them to know about it and to give them the chance to get involved if they wanted to and offer up a bit of SWAG to hand over to those who develop and interest in their system. The response has been better than I even expected. When I reached out, I wanted to be careful I didn’t oversell the Con. Last I saw we were likely to get well over a hundred folks to pre-register. Not a small number to us, as it will be the first of it’s kind, but ultimately not the thousands these companies usually see at conventions. That didn’t seem to matter though, I’ve gotten all sorts of great responses from companies like Privateer Press (Iron Kingdoms), Pinnacle Entertainment Group (Savage Worlds), Monte Cook Games (Numenera), and Pelgrane Press Ltd (13th Age). I’d also be remiss if I failed to mention some great responses from a few Friendly Local Gaming Shops. In the end it has been great just getting the time of day from some of the creators of these fine games I enjoy. If I get my hands on some stuff to help promote their products to some potential fresh faces, it can only help to encourage more interest! I know that most of my readership hails from Twitter, and thus very few of you are local enough to help spread the word of this con, but I’ll be posting this blog post’s address to my Facebook page to hopefully get some local folks interested as well. So if you’re in the St. Charles County Missouri area, or one of it’s surrounding counties, and want to help out a bit I’ll have the flyer attached and you can put it up somewhere if you’d like. Here’s the link to the preregistration page as well. I can only hope that this brings further opportunities for me to advocate for this hobby I love. Not to mention I can only hope this event is a rousing success so it can be embellished on in the coming years to be even bigger! One day I hope to branch my enjoyment of gaming into charity work as well, but that is a topic for another time. Of course, feel free to ask me about it and I’ll chat your ear off. Thanks for reading folks!